The great outdoors can be amazing fun, and spending a night under the stars can be something of a spiritual experience, but it doesn’t change one simple thing – when spending prolonged time outside, you are the mercy of the elements. Of course a sleeping bag is one of the first things that any aspiring camper will be looking to pick up, but have you considered switching out the sack for a blanket? In the summer months these items may provide a little more breathability and flexibility than the zipped-up nature of a sleeping bag. Alternatively, fall and winter travelers may wish to add a camping blanket to their repertoire – not only will they add an extra layer of warmth to the bedtime routine, but you may enjoy wrapping yourself in the comforting embrace of a blanket while stopping to rest. 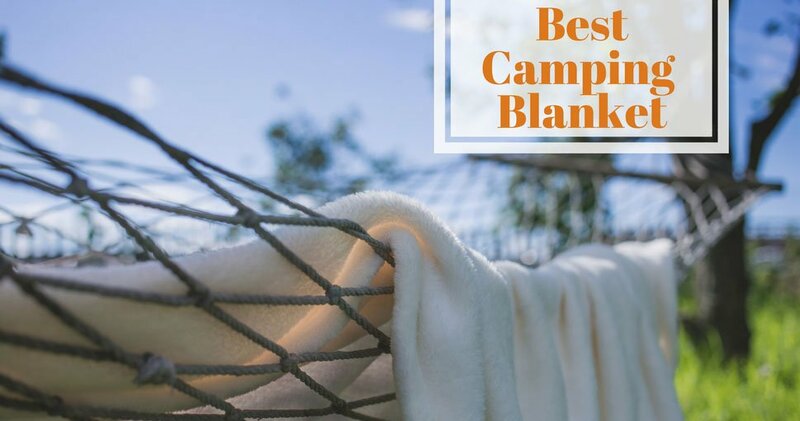 This guide will talk you through what to seek in a camping blanket, and naturally we’ll also recommend a number of quality items to suit any budget or intention to help you make the right decision. Pocket – named as these extremely lightweight and small blankets can be folded up and kept in the pocket – perfect for those seeking flexibility, as they can be used for extra warmth or as a picnic blanket. Wool – the choice of the military, few items are much warmer than a thick woolen blanket; selecting one of these could save your life in the winter. Just be sure to keep it dry! Fleece – provided you do not suffer from an allergy to the material, a fleece blanket could be the best of all possible worlds; the synthetic polyester they use will keep you warm while also repelling water. 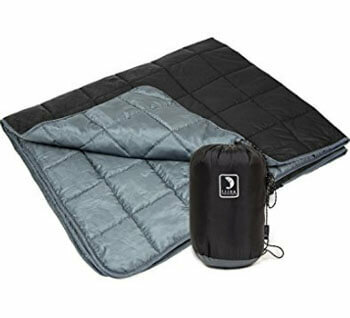 Emergency/Thermal – these blankets come in all kinds of sizes, and are typically small and cheap enough to be worth packing on any trip. 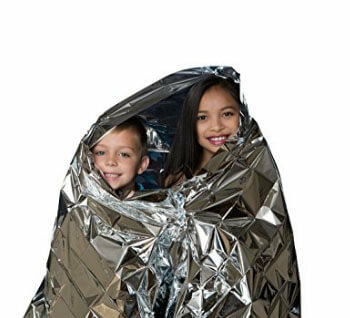 They may not be warmest option (or the most aesthetically pleasing, given that they essentially involve wrapping yourself in foil), but as a safety measure they’re hard to beat. Each of these styles come in a number of further variations and of course it all depends on your priorities. Are you travelling during a cold but dry season and are concerned with keeping toasty? Are you just looking for a multi-purpose piece of cloth that may provide an extra layer over your clothing while also serving as a picnic blanket or cloth for a camping table? How much space will you have once you have packed your sleeping bag (if you’re taking one), tent and camping furniture? Will you be using the blanket for other purposes in addition to camping, such as having something to cover you up on an airplane whilst trying to catch some sleep on a long-haul flight? Weigh up each of these considerations and assess your needs, then read on for recommendations on five of the best options available to anybody looking to a travel blanket to their collection of outdoor equipment. If it’s a cozy and no-nonsense wool blanket that you’re looking for, this is the one for you. Soft to the touch there will be no irritation from synthetic fabrics and materials here, and it’ll keep you toasty – even if you’re unfortunate enough to get it wet; the blanket absorbs moisture and liquid. PROS – A fair price, very little itchiness of discomfort, and a great way of keeping warm when every weather elements seems determined to have you shivering and miserable. CONS – The blanket comes with a very distinct odor or petroleum, designed to deter insects from snacking on you during the night. It’ll fade after a few washes, but maybe that isn’t the most relaxing scent that one can imagine! 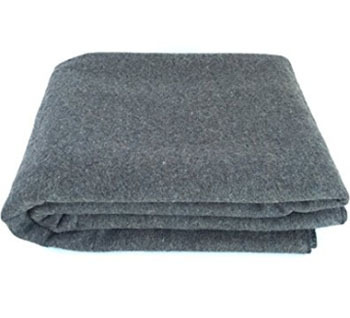 Available in a number of different colors, this pocket blanket can be scrunched up into a tiny size before expanding to an impressive 55" x 60" when unpacked – that’s plenty of space for at least two people to share, whether munching on a picnic or adding an extra layer of warmth over a sleeping bag. 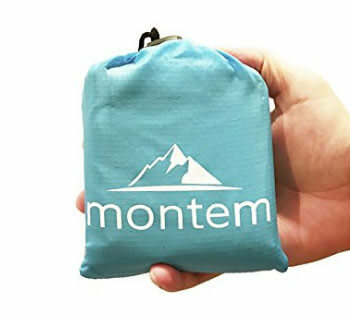 The Motem Premium will keep your derriere dry or add a light cozy quality to your camping trip without adding anything more than 0.5lbs to your packpack – you can’t say much fairer than that. PROS – At a cheap price and utterly flexible, there really are very few reasons not to stuff this into your rucksack before setting off for an outdoor adventure, even if it’s just as an extra option to a thicker alternative. CONS – Obviously a blanket like this is going to be pretty thin, so if you are using as a seat on particularly bumpy ground it won’t be the most comfortable option out there. 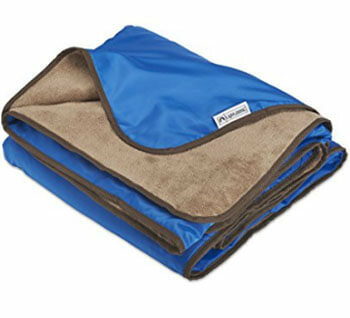 Available in blue and black, this machine washable blanket is perfect for sitting upon or wrapping yourself up in. The blanket folds out to 72” x 58”, ensuring that the whole family can sit upon it or snuggle under it, and it’s at least as water-repellent as a poncho, making it a great makeshift shelter for campers caught in a downpour. PROS – Great to use a windbreaker, protection from rain or somewhere to sit – this isn’t necessarily the toastiest blanket available, but for an all-rounder you can’t really go wrong. CONS – The blanket markets itself as XL, which is great, but it does mean that you have XL-sized material to carry around with you until it’s time to use it. While it’s never advisable to pinch pennies when it comes to safety, these emergency blankets are the perfect combination of cost effectiveness and essential functionality. With 10 blankets provided for the price of a couple of cups of coffee, break out these single-use products if you find yourself freezing, wet or stranded and you’ll manage to retain 90% of your body heat. PROS – These blankets could save your life. Do you need anything more than that? Any responsible backpacker should keep some of these on their person. CONS – You might feel a bit daft wrapped in tin foil, and these blankets really are only for use in an emergency – they’re not items that you will have any desire to open up and sit under whilst watching the stars on a slightly chilly night. Halfway between blanket and sleeping bag, this polyester and nylon item can comes complete with a tote bag for easy transportation. Available in four different colors and sizing up at 58x68”, you can probably easily fit two adults on or under this item, or wrap it around your shoulders for a little protection from the chilly night air. The blanket is easy to clean, and a perfect solution for those traveling with furry friends – pet hair will not cling to this blanket. PROS – Lightweight to carry and surprisingly effective at keeping one warm, this is a fine solution for anybody looking for a compromise in size and softness of material. CONS – It’s not very water resistant at all. It does dry pretty sharpish, but that won’t help when you are shivering in damp conditions. The material can also be a little noisy if you’re prone to tossing and turning at night.